WHAT: Join Swing Left volunteers to swing CA District 10 back to the Democrats by electing Josh Harder to the House of Representatives in November. We will be talking to and registering voters in Tracy CA, a part of the SwingLeft effort to win 23 House seats nationwide. Talking to voters is one of the most important ways we will swing this district! WHERE: Various high traffic locations. WE TAKE CARE OF TRAINING: Don’t worry if you’ve never done this before, we’ll cover everything you need to know. We send training materials in advance so you can get a head start, and provide in person training at the Tracy office before you go into the field. Then we team you up with someone with experience! CARPOOL INFO: Car pools can be fun! We have a great carpool app that will let you join or set one up. The goal is simple: to flip the House in the 2018 midterm elections and put a check on the Trump agenda. 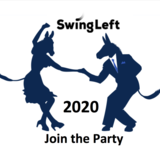 Swing Left is an online network that helps people find their closest Swing District in Congress and connects them with actionable volunteer opportunities. ABOUT SWING LEFT CONTRA COSTA (SLCC); SLCC has partnered with local activists in Tracy, CA which is the most Democratic city in CA-10, our closest Swing District. They lead the way by providing the local expertise. SLCC and other groups bring additional resources. Together we will achieve the goal of engaging those voters, and get them out to vote on Election Day!